Its no secret that recumbent trikes are a bit handicapped on long ascents. Equipped with 30 gears and SRAM Dualdrive one can pedal 90RPM at 3 MPH. With climbs of 500 feet total across a 25 mile ride an awful lot of time is spent climbing. There are times where one may need to ride on a busy road. If that road includes a climb those lower, slower gears add apprehension. Touring inhibitors. Our top speeds rarely exceed 25 MPH on surface streets, even down hills. On trails we limit to 15 MPH. E-Bike systems are designed for bikes. Even the OEM offerings were basically designed for a bike. 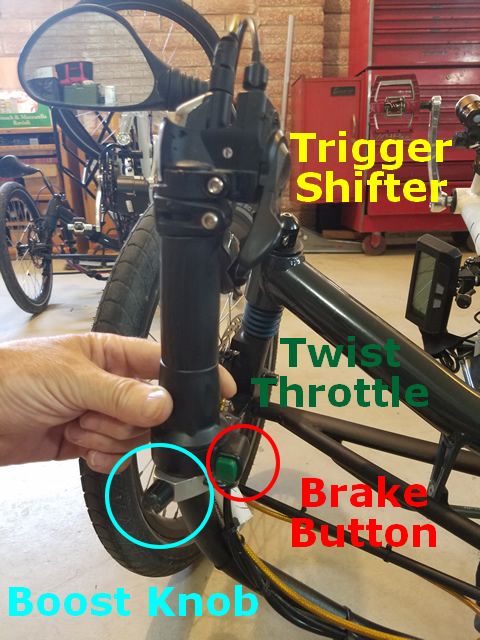 Trikes tend to be a bit different in layout and operation and even the OEM's tend to overlook optomizing the rider's experience with hand controls. Finding the ideal solution took a good bit of research and testing with products that are among an evolving market. After trial of various systems including mid drives and Direct Drive Hubmotors, only the MAC 10T Geared Hubmotor could tick all the boxes for a 26" touring machine. Pedelec experience is enhanced when an accurate Torque Sensor can be tuned more closely to the rider's needs. OEM drives are pretty much limited in this area. Cycle Analyst 3 (CA3) is a powerful computer that acts as the root system controller. Inputs from Thun Torque Sensor, Throttle, Auxiliary "Boost" Pot, Brake Switch, Wired Speedo, and Battery State are monitored with human/electrical data storage for trips. CA3 outputs to the motor controller via normal 0-5V throttle circuit. 8 of the 11 CA3 output screens are shown here. By measuring and displaying your human inputs you can better manage your personal output goals. Both "not to exceed" levels as well as minimal workout goals. We use the CA3 + Thun on trikes without E-Boost. CA3 plugs into a PC for configuration with well documented software. Its a rugged display with the best visibility day or night, of any display on the market. Thun Torque Sensing Bottom Bracket pictured above. There is a tiny cable with JST connectors that is stored in the BB housing to give slack for servicing. It provides an angle input along with a high resolution torque signal to the CA3. 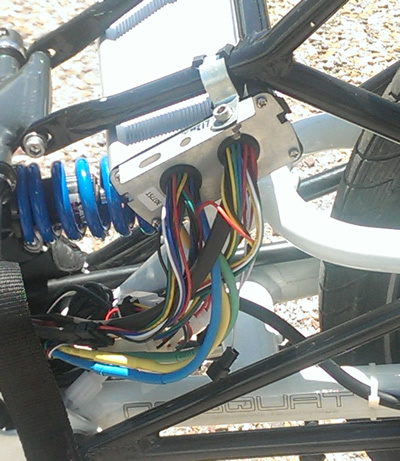 Most of the 2014 & later HPV's came with BB/Boom holes provided for wiring. Otherwise the BB will need to be drilled with a grommet installed for cable exit. There are ways to drill & plug the BB so the cable feeds into the Boom Tube and exits near the CA3. Boost Knob is a 0-5K sealed potentiometer that connects to the AUX port of the CA3 to set the Boost Level Ratio 0-10X for Torque Assist. CA3 tends to pick the highest demand for power so if you twist the throttle while on Torque Assist, the boost rises. The throttle is for quick little bursts, sometimes really nice to have. Stopped in wrong gear? Give the throttle a twist. The first 2500 "MAC miles" were on a 2015 model MAC 12T with screw-on 10 speed Freewheel. 12T/10T/8T/6T, all designate the number of wire run turns per pole. More turns make more torque but require higher voltage to reach the same speed as a motor with lessor turns. 12T @ 40 Amps has brute force torque to spin a tire half a turn off the line. The external Infineon controller was bulky and while quiet, the MAC 12T was far from silent. 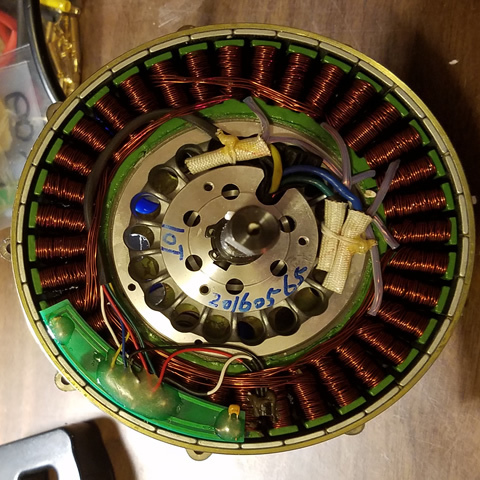 Avoiding the deep science, two leaps forward in Motor Driver Chips were coming to market that seriously reduce noise, and I recently had an opportunity to work closely with one on a commercial project (not a trike). MAC released an upgrade to the products, new castings with a cassette option. Reduced weight, stronger, better cooling. Maybe it was time for an upgrade to motor & controller. A few of the early Sine Wave systems came to market and did indeed reduce noise. The FOC systems took noise reduction to a new level. FOC systems require an initial tuning session so it can characterize the motor precisely; more precise than tolerances require. Its generally about a 10-15 minute process and is only done once for each motor its mated to. 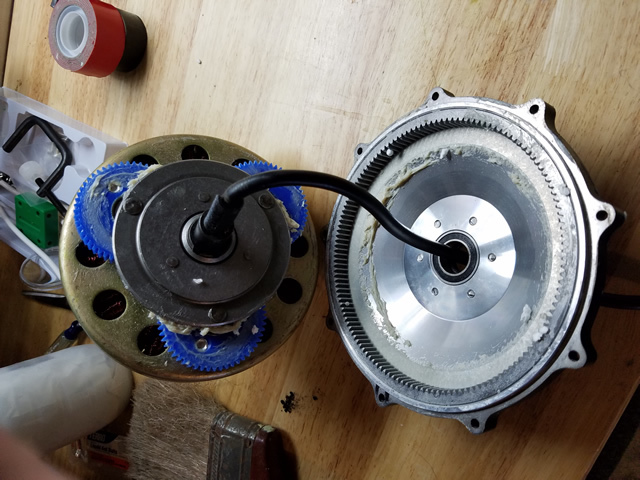 Yes, if you swap the motor with an identical motor, it needs the full re-mapping. The Phaserunner Driver is a joint effort between Grin Technologies (CA3 makers) and ASI, an OEM controller shop. Using FOC technology the Phaserunner has re-packaged cabling to be CA3 friendly. Mounting the hot FET parts on a bar of aluminum and enapsulating in epoxy seals the 1.2 Lb controller. Rated at 40A, set to 30A Peak via CA3. Mounted on the Battery Tray by the Heatsink the Phaserunner barely gets warm after a verylong hard pull. 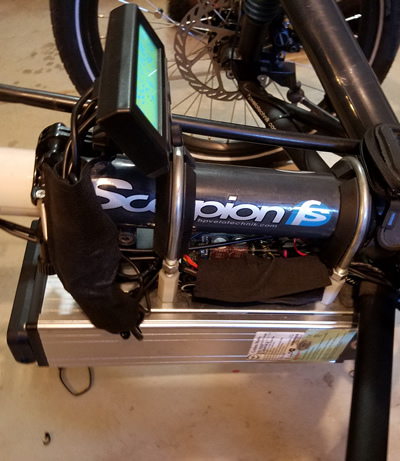 15.92 lbs is mostly the heavy 13 lb 52V 10AH LiFePO4 battery. Under Boom Mounts from McMaster Carr. This only works with the right battery, so I'll take the added 6 lbs for now. Once the Phaserunner was initialized to the new MAC 10T Cassette motor the sound, or lack there of, was astonishing. Below 100 watts the motor is nearly silent. At 300 watts its silent past about 10 feet away. Above 8-10 MPH the wind noise drowns out the motor. 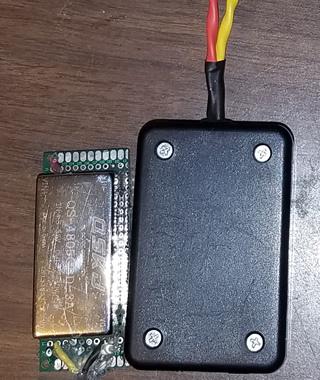 This unit will fall back to sensorless if a Hall Sensor fails, and it only uses the Hall Sensors for starting from stopped; once it starts motion it almost immediately kicks into sensorless mode. MAC is one of the long time players in the Asian Hubmotor market. They build a quality product second to none as seen in their product. Geared motors are more complex than a Direct Drive Hubmotor, and far less complex than a Mid Drive. Gear and Cam Clutches generally have about a 3500-5000 mile life depending on how they are treated. Parts are available (~$80 a set) and aren't too bad to install. Many people get more miles. 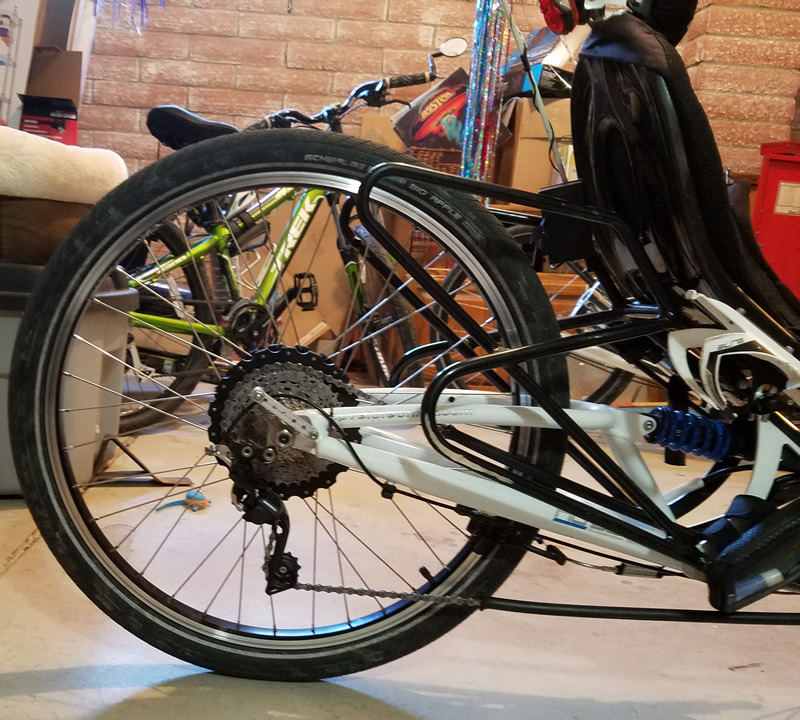 The motor weighs in at just under 9.5 lbs and laced into an Alex DM26 " 24mm wide rim with 13G spokes and 10 speed cassette weighed in a bit under 15 lbs. By contrast the SRAM DD3 laced into a 26 x 19mm rim weighs in at 7 lbs. MAC is geared where the motor rotor has a 5:1 planetary gear set that allows the motor to turn 5 times faster, delivering 5X more torque. This allows the motor to run more efficiently than a direct drive at speeds below 15 MPH extending the range by up to 50%. The MAC has a Cam Clutch Coupling between the gears and motor that engages the motor only in one direction. free wheels from the hub itself so there is no added cogging drag when power is off. The MAC has no regeneration or reverse, but efficiency over a Direct Drive negates the regeneration gains. Direct Drive motors have a heavy feeling always coupled to the large diameter rotor. Direct Drive drag adds cogging blips as the rotor magnets pass over the coils. Where a Direct Drive offers regeneration, hill speed retard, and reverse, it also really begs to be turned on when riding. With 36 poles and 5:1 gearing, the poles are switched 180 times per revolution ("Virtual Rotor Speed") . For a 26" tire that comes to 1 pole switch every .45" of travel. Compare that with a Direct Drive 48 pole (with larger OD & weight) of the same power rating, with a pole switch every 1.74" of travel. That shorter distance of pole switching increases efficiency and torque significantly. Efficiency is a factor of the rate of change, in the case of a motor, how often it moves, "switches phases". That's particularly important to efficiency at lower speeds typical for most trikers. "Virtual Rotor Speed" characteristic. On a 26" rim, a Direct Drive hubmotor reaches its efficiency zone (>80%) at about 16-22 MPH. The MAC 10T reaches the same Virtual Rotor Speed at 4-6 MPH. At speeds between 5-15 MPH Direct Drive Hubmotors are typically at 50-75% efficiency. The MAC reaches its efficiency zone much sooner but does fall outside the efficiency zone above about 17-18 MPH on 52V. By 28 MPH the efficiency has declined to where the MAC 10T - 26" won't go any faster. When the power is off, the geared MAC 10T feels from the pedals like any normal hub because the motor is decoupled - freewheeling. No heavy whirling magnets, no cogging drag. Turn the Boost Knob clockwise from "0X" to "3X" (while turning the Boost Knob, the setting value instantaneously comes up on the CA3 screen), and if you're pedaling with say 50 watts Human input, it seamlessly ramps to an added 150 watts output. Variable from 0-10X with a motor peak of about 1500 watts. Now set it to 10X and hang on as 50 watts of human power becomes 550 watts. Superman Mode will have you rolling 20-25 MPH for about an hour per charge. Normally on the flats I'll set Boost to 0X and pedal. Set the CA3 to display Human Watts & Cadence. When sustained cadence gets lazy (<70) or if I exceed 150 watts pedaling for very long I give the Boost Knob a little twist. Acsending hills is where this system really shines. Most of our rides include over 500 feet of acsent, some of it cranking along at a GI of about 14" at 3 MPH @ about 240 watts. Now we ride those same acsents at 9-10 MPH with 120 watts of human output. Quietest drive I've tested. Power is turned down to 30 Amps Peak with an honest 28 MPH top speed. Having a 500watt continuous rated motor makes it eligible for Federal E-Bike Compliance Certification. The Boost System battery can be used to provide power to the lights, or even a USB with a dedicated 5V output. There are commercial DC to DC converter components with a variable output range of 5-20 volts @ 3 Amps. Bright LED headlights such as those using the CREE XML LED's draw about 10 watts (typically 8.2V at 1.2 A). Add a tiny mounting PCB, enclosure, wiring, connectors, and 3A inline fuse. This enclosure is 1.5" wide, 2.5" long, 1.0" tall and is mounted to the Battery Tray. Can typically power a bright Headlight and Taillight. The test trike has a Golden Motors LiFePO4 48V 10AH Rack Mount Battery. At 13+ Lbs this battery has very little voltage sag under high amperage loads with a charged voltage of 53V. Dimensionally it fits under the boom rather well, and ride stability is very much improved when the battery is installed as it lowers the Center of Mass slightly. The Battery Tray Mounting Clamps are from McMaster Carr and the plastic inserts don't marr, scratch or deform/stress tubing. 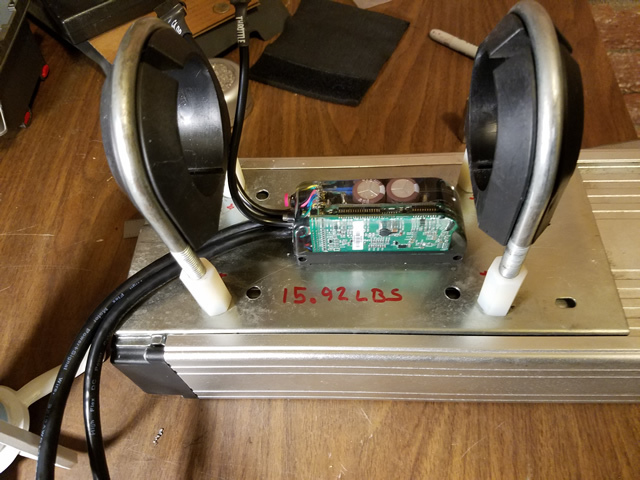 With Phaserunner and DC-DC Converter mounted to the Rack Plate, the entire assembly weighs 15.92 Lbs and is the next area targeted for improvement and may take another year depending on time & $$ available. Development focus is on shrinking size a little, cutting weight to 10 Lbs (without loosing performance), better cable management, adding CA3 mount, and tidy package integration & apperance. So are you ready to build one? The following Bill of Materials (BOM) is the basic list of parts with the same vendors, part numbers, and links used to order everything except the battery. I may not maintain links if they change in the future. While pricing looks tempting (and no doubt some shopping may pinch pennies), the next sentence will bring you down to earth. That still leaves you with placing all the orders (and receiving, unpacking, etc. ), installing, hooking it all up, tying down/tidying the cabling, and configuring both the Phaserunner and Cycle Analyst 3. Phaserunner setup includes a motor initialization and programming that takes roughly an hour after everything is connected if you know what you're doing. If you don't it may take much longer. Most CA3 parameters can be downloaded, but Thun Calibration is better done manually. There have been a few requests for a Configured Clone Kit over the last year; turns out one ride and you're hooked. Anything is possible, but the logistics required would better suite building an entire Trike Kit frame like HPV/AZUB/Stein and build it up. Daily Life with the "MACBoost"
This trike is used on neighborhood roads, paved trails, sometimes gravel or hardpack dirt, mostly in mountainous areas. On the flats down hills, no added power needed. Up hills, boost is needed. Sometimes its nice to have when crossing a road from a stop. To be able to ascend a 7% grade while keeping barely pace with a middle aged roadie is pretty much the target for sustained power. On paved trails we rarely exceed 15 MPH, and never exceed 20 MPH or any posted limits. Ride safely and no one will pester you. That said the MAC 10T + Phaserunner package has surpassed my expectations significantly. We recently rode 400+ miles of trails through City, State and National Parks with steep elevation changes. Keeping a strong pace climbing a hill pulling about 350 watts I ride past a Mule Ear Deer who just stands about 6 feet off the road and watches me go by, not quite silently at that power level but quiet enough not to scare the critter. We ride between 10-40 miles at a time depending on how long we have, and typically keep a 10-12 MPH average moving pace. Typically its a 60-80 mile range with highs of over 100 and down to 31 miles depending on the "Fundial" settings used. Typically it burns about 6-8 WH/Mile on a full ride, but as we're heading up a 5-6% grades at 10 MPH it may be pulling 20-25 WH/mile. Normally charging is only done after about 40 miles or 4 Amp Hours is shown on the CA3. It takes about 3 hours to charge from 80% drained. Nice thing is if you do run out of battery you're not lugging the motor along on your journey. 95% of the time under power I'm running in Torque Assist Pedelec (TAP) mode. Throttle is rarely used other than a strong pull off the line, or maybe a quick bump in speed. During TAP mode the Auxiliary Input Knob (located just below my left grip) is easy to "pinkie dial" a ratio - 0-10X input watts to output watts. After about 200 miles the system becomes incredibly intuitive. Wide Open Throttle from a standing start ramps up to about 1500 watts after about 2 seconds climbs to 1800 watts, than slowly drops to a steady 650 watts at 28 MPH. The CA3 speed limit can be set to 28 MPH if needed. Don't ask what 0-28 MPH is, I never timed it. For another $150 the CA3 will datalog that. On the flats despite the added weight most riders won't feel any real drag other than accelerating. Then again sometimes its nice to get a little 1-2 MPH bump while pedaling at the same energy level, just pinch the "Fundial" a little bit and the "silent partner" kicks in while you pedal. Having a well matched set of gear ratios makes a big difference. Cadence, gearing, tire size, speed limit, everyone is different. Matching the gear train to your needs makes Torque Sensed Pedal Assist respond like accurately with little delay. Middle Chainring most of the time, small for climbing, big for downhills. With a 36/11 Cassette the boost tends to increase shifting to similar rates to a brisk bike ride. Trigger Shifters make rapid shifting easy without moving your hand off the Grip. Well worth the looped cable. Note: The sound you hear is NOT coming from the HPV-MAC drivetrain, its coming from the TSDZ2 in front. Need to add some direct motor video. Version 1 used the earlier model MAC 12T motor with screw-on 10 speed freewheel. Controller limited to 40 amps. This configuration was run once on a steady hill climb at 7% average grade at full throttle ~ 19 MPH until battery was 80% discharged on a 104° day. Then run for another 2500 miles @ 30Amp limit problem-free. Phaserunner from Grin Technologies is a repackaged special order BAC 500 from Accelerated Systems Inc. (ASI) Grin makes hardware changes and includes connectorized cables than pots that updated BAC 500 re-branded as the Phaserunner. Its a really sweet (a little costly) controller that plugs into the Cycle Analyst. This system needs to go through about a ten minute mapping process of the motor via PC interface to Phaserunner, connected to motor elevated off ground to turn freely. Strange sounds may be heard as it sweeps through various frequencies and amplitudes of the series of tests. Geared motors are a little tricky as the calibration actions can only be run in one direction. Hall Sensors are positioned like clock signals to switch phase signals, one for each of 3 phases. By mapping the electrical characteristics and measuring/sampling them say 100+ times every pole shift the actual rotor post ion can be determined far more precisely with 100+ increments between Hall Sensor switching events. Field Oriented Controller feedback loops are efficient software state machines running at very high speed to manage the electrical torque on demand. Motor knowledge tells us Torque is related to current (Amps). Throttle voltage makes the call to the controller for the actual amperage output. The state machine takes that call and maps out the next steps of the entire cycle maybe 100 steps before the next phase change. And each set of cycles is based on the smoothest ramping of power. If Hall Sensors are connected this mapping process will automatically align them in a database table. Once the system has been mapped that map includes true Home Positions for each phase as measured electrically. Hall Senor's positions as relative to the electrically measured positions are added to the database only as markers. The only benefit to Hall Sensors for some FOC Chipset systems is on start up. Without Hall Sensors, some motor noise may impede initialization on starting leading a stumble for the first second or so. Not all FOC Chipset's do this with all motors. 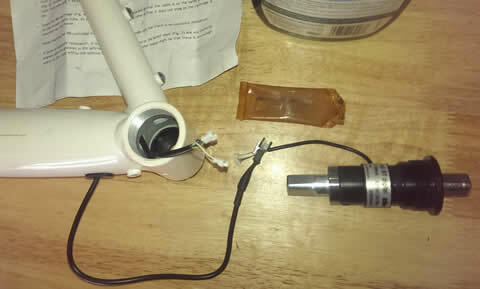 But then again, if you ever loose a Hall Sensor it won't stop you. Field Weakening is interesting in concept anyway. There is a way to offset the voltage factor that determines the speed ie, "RPM/Volt". So if a 48V rated wheel could turn 192 RPM at 48 volts, that's 4 RPM/Volt. What if you could artificially change that to 4.5 volts/RPM as you reached 192 RPM? 4.5x48 = 216 RPM. So if you really had to you could tweak the upper speed capability by maybe 3 MPH. Not something I have needed to do yet. II recently ordered a BAC500 unit from ASI play with. It has the original ASI Molex Connectors that will be converted to JST. It uses a slightly more complex interface but cuts cost in half.